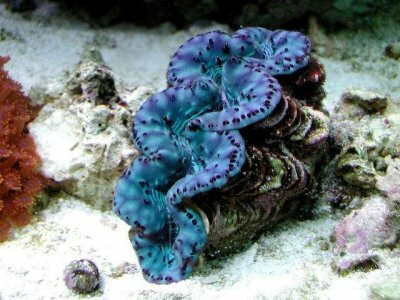 Giant Clam Care, Clam facts about the Care of Tridacnid Clams starts with what to know about giant clams for sale, the reef aquarium setup and lighting, placing clams in the reef tank, feeding and caring for them, and watching out for hitchhikers, predators and pests! Giant Clam Ailments, Friends and Enemies. Facts about clams predators, hitchhikers, pests, and diseases - everything from pesky fish, snails and crabs, to clam worms, mantis shrimp, and Protozoans! Hi. I have 3 buffons macaws (2 boys and a girl) and 1 greenwing macaw (boy)for sale. All are DNAed. I have been diagonosed with arthritis and can no longer care for them as they deserve. I live in Canada. If anyone is interested please email me. Giant Clams, both the Hippopus Clams and the Tridacna Clams, are beautiful, hardy, grow rapidly, and require little care! All of the above is true when speaking of a clam that is already well adapted to your aquarium. As with all pets (in your tank or otherwise), they must be taken care of properly in order to actually live up to those claims. Once established a giant clam makes an awesome addition to a reef aquarium. Though like all reef inhabitants, it will need good water quality and proper lighting, it will require little else in the way of care. Giant clams can give you a number of years of enjoyment, however the initial adjustment to your tank can be a considerably difficult time. The differences in lighting, pH, temperature, salinity, water current, and more can be drastic to the new clam. It's important to be as well prepared as you possibly can for the care of your clam before actually purchasing one. Try to purchase farm raised giant clams instead of collecting them from the wild. Tridacnid clams have been exterminated in many areas because of over harvesting, collected for food and shells. The mariculture of tridacnid clams was begun to re-stock areas where the clams had been eliminated, and to provide a farm raised source of clams for food. A portion of the farm raised clams now goes to the aquarium trade. Profits from the demand of aquarists has raised interest in producing colorful varieties of all the species. Ask your fish stores and online sellers for farm raised clams. The Crocea Clam reaches sexual maturity around 3" and/or 4 to 5 years. They will shoot out their sperm or eggs every 2 minutes. A good skimmer to help rebalance the water parameters will help if one of these events occurs. SPS tanks with about 2 ppm of nitrates is the perfect environment for your clam. The Derasa Clam is one of the easier clams to care for with a few notable facts. First, they are able to get by with moderate light, unless they are bright blue (rare coloring) and will do fine with Metal Halides, intense LED and strong T5s. They are still for intermediate aquarists who can maintain stable and clean water parameters. Acclimate them to a bright aquarium's lights slowly and over about a weeks time. They will grow 3" per year, so where they are placed will eventually be taken over by an 18 to 24" clam! Uh, no they are not a good choice for nano tanks! The coloring on this clam is a perfect example of a Derasa's warmer tones, mixed with iridescent accents and stripping. Video shows WHY they are best left in the ocean. The Gigas Clam has been known to grow to 4 feet, weighing around 500 pounds. The record is 4.5" and over 750 pounds, which emphasizes the reason that these clams are best left in the ocean to clean the water there. Living over 100 years long, if a clam out lives it's owner, is it unlikely a new owner beyond an aquarium would take the clam. Once they reach 12" and there are fish in the tank and the light is strong, feeding them is not as necessary, however the nitrates SHOULD be at least 2ppm. This video shows that Maxima Clams are like fingerprints, in that no two ever look the same! They have light sensors on the mantle and do need a lot of lighting. Keep your tank kelvin range from 6K to 10K for best results. They do best in a tank that is at least 100 gallons. Maxima Clams can live over 200 years and will reach 14" around 70 or 80 years, however most do not live that long in captivity and will more than likely grow to around 8 to 9" in most aquarists tanks during their first 30 years. Squamosa Clams usually will reach around 12" in captivity. They can reach almost 18," although it will take 60 to 70 years to do so! This video shows the beauty of the Squamosa Clam in great detail. Provide a tank that is at least 100 gallons for stable water and very strong light. These are considered a beginners clam, and strong light, an at least 6 month old tank and only turbulent water flow that can be low to high is required. Straight water shooting from a pump will cause the clam to eventually die over time for various reasons. The beauty of this clam is also seen in it's shell! The Hippopus or Bear Claw Clam is only one of two clams in this genus, Hippopus. They typically grow to 16," so they will need a 100 gallon tank, stable water, moderate to strong lighting and low to high water flow that is turbulent, not linear. These are the most durable of the clams, suitable for beginners that can handle a 100 gallon system. They have very attractive shells, demonstrating beauty inside and out! Temperature: Mid to Upper 70° F. (mid 20° C.). Do not let the aquarium exceed 84° F.
Salinity / Specific Gravity: 1.024. Salinity is also important, too high or low a salinity can cause the death of a clam. Try to keep specific gravity between 1.023 and 1.025.
pH: 8.3. Do not let the aquarium exceed a pH above 8.4. Hardness: Maintain a dkh of 7.9. Water Movement: For most giant clams low to moderate currents will be tolerated. Giant Clams will do well under moderate to relatively high lighting intensities. They don't particularly like intense lighting nor will they tolerate sudden increases in intensity. Take great care if attempting to acclimate them to intense lighting such as metal halides. T. gigas can be adapted to metal halide lighting, but this should be done over time as a gradual process. With brighter lights, you can place your clams lower in the tank. With lower intensity lights, you will be forced to place them near the surface. The Crocea Clam T. crocea and Maxima Clam T. maxima need the most light.. These are followed by the Gigas Clam T. gigas, Derasa Clam T. derasa, and Squarmosa Clam T. squamosa. The least amount of light is needed by the Hippopus Clam H. hippopus. Â Â Most clams need a lot of blue light in the bulb's spectrum. The Derasa Clam T. derasa needs less blue light than Gigas Clam T. gigas and Maxima Clam T. maxima. Clams with brown mantles do not require as much light as those with blue mantles, usually, and are considered easier to keep in the home aquarium lighting wise. Clams with blue mantles are usually found in shallow-water. The blue pigment acts as a light filter and so they require substantial quantities of light. A good rule to stick to is, the more colorful the clam, the greater quality and quantity of light it will need. As the clam grows, its mantle will thicken and the number of zooxanthellae will increase (with the deeper lying zooxanthellae receiving less light) and it will require more and more light. Smaller clams, those less than 1.56 inch / 4.0 cm, require less light to maintain their optimum growth while the larger clams require more light. Also, juvenile clams will adapt to lighting variables more readily than adult clams. When you take a clam from the sea and place it in the aquarium, the difference in the spectral composition of the light can have drastic impact on the clam's food supply. A clam at sea receiving the full light spectrum transferred to a tank with the same light intensity, only with blue wavelengths dominating, is receiving the same amount of light but some wavelengths are missing and others are in greater quantities. Depending on the clam's adaptation, some of the zooxanthellae's assimilation pigments may cease to function and pigments that would use the new wavelengths aren't even present. Basically in this situation, the new lighting is incorrect for the clam even though the intensity of the illumination is the same as before. The clam can adapt to the new spectral composition, slowly, but the time needed for this to occur may be too long. This leaves the clam weakened, with less resistance to defend against predators, diseases, etc. Smaller clams require less light. Recently imported or transported clams usually exhibit a behavior called gaping. A gaping clam will appear as follows: shell fully open, mantle poorly extended, and inhalant siphon widely stretched. This eventually passes. Gaping will continue if the clam is kept under insufficient lighting, is damaged, or unhealthy. The mantle will begin to pull inwards, shriveling and tearing between the siphons. A healthy clam's inhalant siphon can open wide sometimes, but gaping leaves a very wide opening. The clam will stay like this for as long as the clam is unhealthy. The clams mantle should be colorful everywhere with no clear or white areas. Colorless areas may be the result of poor lighting, predators, or disease. A clam will quickly recover from poor lighting once conditions are improved. NOTE: It is normal for T. gigas to have clear areas near the center of their mantle. Also check for rips and tears in the mantle. A healthy mantle should be extended over the edge of the shell and not pulled inwards. NOTE: It is normal for H. Hippopus' mantles to not extend over the shell. A healthy clam should react to external stimulus by forcefully closing its shell. Newly imported and transported clams tend to react more slowly, but will improve as they regain their strength. The byssus gland should be undamaged. You should not see any torn or loose tissue hanging from the bottom of the clam. Some byssal strands may be visible, but no solid tissue hanging loose. Byssal gland damage isn't always visible, however. The clam may appear fine for a couple of weeks and then die suddenly for seemingly no reason. On the good side, byssal gland damage isn't always fatal. According to The Reef Aquarium Volume One, Delbeek and Sprung have collected and purchased damaged clams with little loss. If the clam is attached to substrate, please take care when detaching. Lift the shell gently and insert a sharp knife, razor, or scissors and cut the threads as close as possible to the substrate. Do not cut close to the shell. You could cut into the extended byssal gland. If the clam is attached to a small rock, pebbles, etc., just leave it alone. The Crocea Clam T. crocea and Maxima Clam T. maxima are very sensitive about being handled like this and are best left attached if possible. Farm raised giant clams: Hatchery (culture/farm) systems for giant clams are setup basically the same. Baby clams only live a short time in tanks. Once the clams reach 0.75 to 1.25 inches (20 to 30 millimeters) they are moved to ocean nurseries. They spend the rest of their growing time, until they reach about 1.5 inches (4 centimeters) or more, in the ocean. This is true for majority of the clams, regardless of their species, that are marketed to the hobby. So, even the farm raised clams are from the sea! A hint for clam sellers: A good way to display clam stock would be to place them on small cups or pots filled with crushed coral. This way the clam will only attach to the gravel. This makes it very easy to remove the clam when sold and with much less stress on the clam and its byssal threads and gland. There is also less stress on a seller who has to dismantle their display to detach the clam while the customer stands around waiting. Rinse the gravel routinely to prevent worms from moving in. The pots will also help keep the clams upright and positioned properly under the light source. Dealers can also hang a mirror above the aquarium (at a 45 degree angle). The customer will then see the true colors of the clams without having to contort themselves. Once placed, clams generally cannot move around on their own. This is why where you put them in your tank is of vital importance. Clams placed on hard surfaces (rocks) will not be able to upright themselves or shift their positions. Clams on sand can manage to upright themselves or shift positions with small movements. Don't expect your clam to move any great distances. Juveniles clams settle permanently, only using their foot to travel short distances. Generally the larger the clam, the less moving around you should expect, which basically means your clam's place in your tank and its happiness there is really up to you. Clams can close their shells with enough force to expel a surprising amount of water out of their siphons. If you place your clam near the top of your tank, this water may be expelled out of the tank or up into your lighting system. Clam's may also accidentally trap small, slow moving fish that rest on their mantle (for example, mandarins, gobies, hawkfish, or blennies). Find as flat a surface as possible and place the byssal opening flat on the substrate with the mantle facing directly up. Horizontal surfaces are best for clam placement. If you insist on putting your clam on an incline, make sure the byssal opening is on the lower portion of the substrate. If the incline is too great, the clam will not receive enough light, so do not place it on steep substrate. A clam may fall over several times before it firmly attaches to the substrate. A good idea is to put some small rocks (crushed coral, large pieces of substrate, etc.) around the clam to help it stay upright. These small rocks will not get in the way of the opening and closing of the shell. Your clam will attach within a few days to a week. Substrate is not related to attachment speed. Once your clam is attached, you can remove the rocks, unless the clam has used them in its attachment. Do not place your clam between large rocks, inside small holes, or up against the tank wall, or you may prevent them from opening fully. The Crocea Clam T. crocea and Maxima Clam T. maxima are found in rocky habitats so it is best to place them on rocks. . The Squarmosa Clam T. squamosa, Derasa Clam T. derasa, Gigas Clam T. gigas, and Hippopus Clam H. hippopus are best placed on sandy substrates. Remember the lighting requirements of the clam you are putting in your tank. Clams with colorful mantles need a great deal of light. Clams with brown mantles, not as much light. If your clam has a brown mantle, place it nearer the bottom of your tank, or shield it (an overhang would work well for this) from strong lighting if you have to. Don't leave a clam that has fallen over, upright it as soon as possible. Place the clam so the inhalant siphon (which lies above the byssal opening) is on the lowest portion of the slope. As the clam grows it will place greater strain on its byssal gland, so if the gland is on the upper portion of the slope, the weight of the clam could gradually pull the gland out. Adult Hippopus sp. tend to sit more on their hinge than on the byssal opening. Giant clams should be placed so that the majority of their mantle is facing upwards. Juveniles will attach themselves to rocks with byssus threads just as other tridacnid clams do. GIant clams do not like strong currents, especially the Crocea Clam T. crocea. Do not place them where they would receive strong, direct water currents. Too much current will cause your clam not to open. They do need water flow to bring nutrients to them, just not too strong. Keep your clam as far away from any aggressive coral or anemone as is possible in your tank. If sections of the mantle are pulled away or shriveled on the same side as a coral or anemone, it is probably irritating the clam and move the coral, anemone, or clam as soon as possible. Do not hesitate, or it will die quickly. With proper lighting and careful attention, giant clams require little else in the way of care. It is important to make sure they are not being irritated, not being fed upon by other organisms, and good water quality must be maintained. Giant Clams can be kept in a reef environment with live rock and coral substrates. The number one cause of a giant clam's demise is usually water quality. A high pH and high temperatures can cause problems. Giant clams receive the majority of their nutrition from their zooxanthellae, whether additional feeding is required is still debated. Some hobbyists believe that tridacnids should be fed, going on the assumption that they are filter feeders like other clams. According to The Reef Aquarium Volume One, when Delbeek and Sprung attempted to feed the clams, they closed forcefully and expelled the food. They may accept a dilute suspension of live phytoplankton or a yeast. However, the effort required to feed these items is not worth it in the opinions of Delbeek and Sprung. Delbeek and Sprung noted that for many years, Tridacnid clams have been grown successfully in both culture systems and home aquaria without any supplemental feedings. They noted that bacteria, organic and inorganic compounds are always present in the water of closed systems (like our tanks), and these may be consumed or absorbed by the clams. Of opposing opinion, Albert Thiel noted that in some cases supplemental feeding may be necessary. What those "cases" are was not mentioned. Mr. Thiel further notes that small foods should be used and that clams do not feed on large chunks of food. Use good quality food like shrimp or scallop meat run through a blender. Giant Clams - What Do Clams Eat? Basic nutrients in the aquarium that these giant clams need are calcium, strontium, iodine, magnesium, and possibly a minute amount nitrate. Calcium: Calcium is the main building block for clams and should be present in the water at levels of at least 280 mg/L for growth to occur. More rapid, natural growth is seen when calcium is in the range of 400-480 mg/L. Strontium: Strontium is incorporated in the shell along with calcium and should also be provided for optimum growth. Iodine: The addition of iodine to the aquarium will also enhance growth and color in giant clams. Nitrate: They require some nitrogen for proper growth. Nitrate can be added if levels are extremely low, but be careful as nitrates should never exceed 2 mg/L. Clam's sometimes arrive with growths of encrusting organisms on their shells, especially the Maxima Clam T. maxima and Squamosa Clam T. squamosa. Check these growths very carefully. Dead or necrotic areas may foul your tank. Various parasitic snails can be imported with your clam. They are carnivorous boring snails and that description should be enough for you to want them out of your tank and as far away from your clams as possible. Look for small rice grain-sized, cream colored spots near the base or hidden within the flutes (the grooves and indentations in the shell) of the shell, or, at night, along the upper edge of the shell. If the clam is attached to a rock, check by lifting the clam a short distance off the rock and look underneath. You are looking for small (0.08-0.2 inch / 2-5 mm long) snails. Remove all of these snails. If you have the facilities, quarantining your clam until you are sure all the snails are removed is a good idea. Also check for the egg masses of these snails and remove them as well. They are small, jelly-like masses on the shell. Don't confuse the jelly-like mass some clams excrete around their byssus opening for these egg masses .Keep looking for these snails. Just because you think you got them all when you added the clan to your tank doesn't mean you really did! Symbiotic shrimp from the family Palaemondidae (Anchistus, Conchodytes and Paranchistus) or small crabs such as Pea Crabs of the family Pinnotheridae may be visible through the inhalant siphon in larger clams. These animals live inside the clam and do not harm it, although what they eat and what they do for the clam is unknown. In the wild, small tridacnid clams are heavily preyed upon. Many species of fish (triggerfish, large wrasses, puffers, etc. ), crabs, lobsters, shrimp, polychaetes (Bristleworms, Fireworms, etc. ), octopi, and snails prey on clams. Even burrowing sponges! Since most of the clams available to aquarists are juveniles, hobbyists should be extra cautious about both predators and environmental factors that can wreak havoc with a clam. Certain wrasse species (Family Labridae) are bad tank mates. Species like the Twin Spot Wrasse Coris aygula and Bird Wrasse Gomphosus varius have been known to attack and devour juvenile clams in the aquarium. Sometimes the clam is eaten from above or knocked over and eaten through the soft and unprotected byssal opening. Any large wrasse species should be watched closely when introduced into a tank with giant clams. Other fish can also irritate clams. Fish that are constantly grazing like as Centropyge sp. (Pygmy Angelfish), Ctenochaetus sp. (Chevron Tang, etc.) and Acanthurus sp. (Achilles Tang, etc.) Tangs, and Ecsenius sp. (Blennies) will occasionally nip at a clam in passing. Sometimes small pieces of tissue are removed but the problem is that the clam is now irritated and it will expand less and less. It may eventually expand so little that it won't receive enough light and will slowly die. Large crabs will eat clams and usually shortly after they are placed in the tank, before they can attach to the substrate. They attack the clam through the byssal opening, but larger crabs just crack the shells open. Certain species of shrimp can also prey on clams. Large shrimp such as Marble Shrimp Saron marmoratus and Buffalo Shrimp Saron sp. will attack clams at night. The common Cleaner Shrimp Lysmata amboinensis has been known to attack clams. It's rare, but it does happen, especially when the clam is injured and the shrimp hungry. Parasitic snails are sometimes imported with tridacnid clams as mentioned earlier. Examine new clams closely and remove any snails or eggs right away. Algae is another problem for clams. If algae begins to grow over the lip of the shell, the mantle may become irritated and it will not expand as much. Macroalgae like Caulerpa can irritate the clam from underneath if allowed to grow under the byssal opening. If this happens, the clam will produce large amounts of mucus from below that surrounds the base. If Aiptasia are allowed to grow on tridacnid clams, they can reach underneath the mantle and sting the clam. This will result in the mantle pulling away and the clam will eventually die. Polychaete worms such as the larger Nereis sp. and Eunice sp. can prey upon tridacnids. They are usually active at night and feed on the clam from below, through the byssal opening or by boring a hole through the shell. Air bubbles can be a problem too. They can become trapped inside the clam and cause the clam's demise. Authors: Elizabeth M. Lukan / Clarice Brough, CFS.